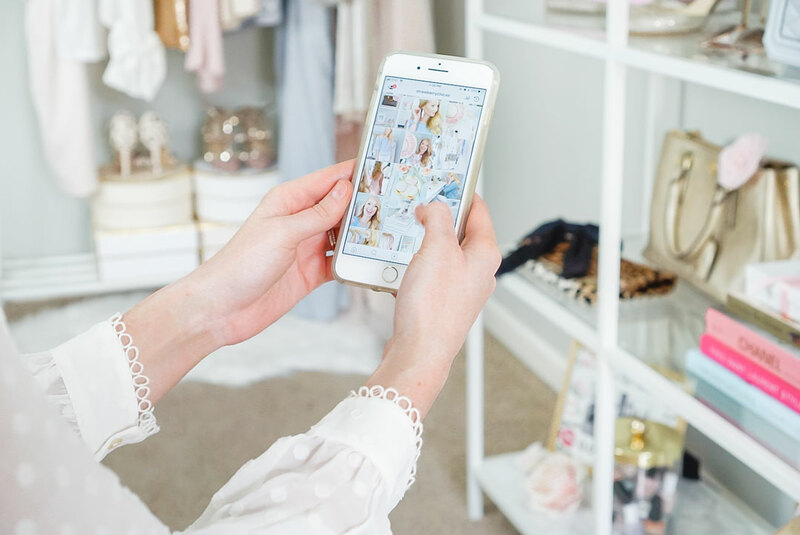 I just got off the phone with my friend and what started as an invite to shop together for the Nordstrom Anniversary Sale turned into a conversation about how LIKEtoKNOW.it operates and how bloggers make money through affiliate links. She found it very interesting and thought others would want to hear about how affiliate commission works. In this post, I hope to answer all of your questions about affiliate income, LIKEtoKNOW.it, and how bloggers make money through affiliate links. In a nutshell, it is a tracking code in a link. With affiliate links, the person sharing is getting credit, either by referrals to a site (FabFitFun or HelloFresh for example) or by making a commission from an item. Reward Style (rS) is the middleman between bloggers and affiliate networks. Some retailers offer their own affiliate partnerships where people work directly with their company (ex: Amazon Affiliates). Reward Style offers multiple retailers on their site, allowing bloggers to sign up for one platform to share affiliate links from multiple retailers. Unlike most affiliate platforms, rS is somewhat exclusive because you have to get accepted into the program. LIKEtoKNOW.it is the platform Reward Style created to allow people to shop Instagram photos. You have a few different options to shop through LIKEtoKNOW.it links. Click the link in my Instagram profile. All the pictures that show up here are linked through Reward Style. Clicking the image will pull up all the items linked in the photo. Click LIKEtoKNOW.it and go directly to my shoppable webpage. Download the LIKEtoKNOW.it app and follow the people you want to shop. The app is like it’s own shoppable Instagram feed. In the app, you can click a photo and directly get all the links. Swipe up feature in IG Stories: A blogger needs 10K on Instagram and a business profile you to get the swipe up feature. This feature takes you directly to one link. There are some tricky things when shopping this way, so keep reading to see how shopping through swipe up works! If you have the LIKEtoKNOW.it app, you can also screenshot photos while scrolling through Instagram and the LIKEtoKNOW.it app will send you a notification almost instantly with the outfit details. You might be like, I don’t want any screenshots on my phone! There is actually a cleanup feature in the LIKEtoKNOW.it app that quickly removes all your screenshots from your phone. Go to your account in the top right corner then click clean up your screenshots. It will only delete screenshots with the LIKEtoKNOW.it feature, so the rest of your screenshots are safe from the cleanup. 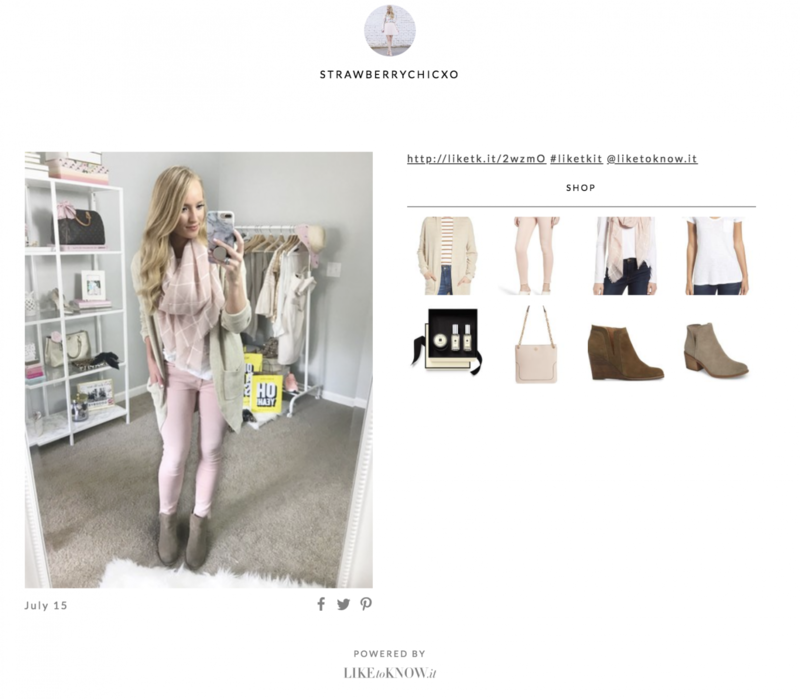 You can also visit the LIKEtoKNOW.it site to shop bloggers feeds on your desktop. You can also DM me for a link and I will be happy to send it to you! Why do bloggers use LIKEtoKNOW.it and not just tell me where things are from? I can’t speak for all bloggers out there, but obviously, it is to make money from their content. Here is why I use it. I have a full-time job as a Physical Therapist and started blogging in PT school as a distraction from school stress. Blogging has remained a hobby to me because I never want it to cause me added stress… I truly enjoy it! But, I do try to supplement the time I put towards it after work and most of my weekend to help as a second source of income. Really income is a big word for the amount I actually make, but it’s something! Instead of working an extra Saturday shift as a PT (I would make more doing that but 5 days a week is enough, lol), I enjoy being creative and sharing what I love. This year I became really focused on paying off my student loan debt, so I talked myself into putting my extra income from affiliate commissions towards my student loans. Also, When I see a sale from you it honestly just makes me so happy to know you read my content and trusted my thoughts enough to purchase something I’m sharing. Does it cost me to shop through a bloggers link? You’ll pay the same price whether you shop through an affiliate link or not. You can also use whatever coupons you have for your purchase. The overall price you pay pre-tax will be the amount commissioned to the blogger. How much do bloggers make with each sale? The majority of bloggers don’t make a full-time income from affiliate links alone. There are many ways to make money blogging and this is just one revenue stream. There are of course bloggers who are successful with just affiliate commission alone. I can’t disclose exact amounts due to rS terms of service. It can range anywhere from 4-50%. To be honest, there isn’t a straight answer from Reward Style to bloggers in terms of exact commission from sales. They only give us a commission range and an estimated commission per item. Since we can’t see what items were purchased, there’s really no way for us to backtrack or keep up with our commission. Do I have to buy the exact item? A lot of my friends thought they had to buy the exact item from affiliate links, but that isn’t the case! Say you click on my link and you see the top is sold out in your size. While you’re there you start browsing the new arrivals and you see another top you like. If you buy that top or anything else after that click, I will make get a commission from the sale. If I follow a lot of bloggers, who gets the commission for the sale? If you follow multiple bloggers and click on a lot of different links to the same retailer, the last link you click will override the previous links to the same store. The blogger who gets credit for the entire sale is the one whose link was clicked last. The commission is subtracted from the blogger for any returns. And sometimes, unfortunately, the entire sale will be deducted even though you only returned one thing. That’s isn’t always the case, but it can happen from time to time. Can I swipe up then checkout on my desktop? No, the affiliate links aren’t transferable between your devices. If you swipe up on your phone and add it to your cart, but end up checking out on your computer, the blogger won’t make a commission from the sale. Do I have to buy right after clicking to give the blogger credit for the sale? Yes and no. The affiliate links don’t work the same on your phone as they do a desktop. If you’re shopping on your phone in Instagram and swipe up on a link, you have to check out while still in the Instagram app in order for a commission to count. You can browse the website if you want more items. If you click your home screen button or open another app, the affiliate link won’t store on your phone. You have to swipe up again for the blogger to make the commission. If you’re shopping on a computer, you don’t have to buy immediately for the blogger to get the commission. Clicking the link will create a cookie on your computer that remains active for around 30 days (unless you delete your cookies). Side Note: Using sites like Ebates will override affiliate commissions. Technically, Ebates is an affiliate network that is making money from your sale but giving you a small percentage. Do bloggers get everything for free? Bloggers do get to try free things from brands through PR mail; however, if they were gifted something or paid to talk about it they have to disclose that to you. When it comes to fashion items, most brands will allow the blogger to pick out the items they want to style or they will get a gift card to buy clothing. What is #ad? Why would bloggers want to say it’s an ad? It depends on the platform the blogger is using. RewardStyle does not pay for clicks, only purchases. Shopstyle is a different platform that does pay-per-click, but the amount paid changes based on the volume of clicks. 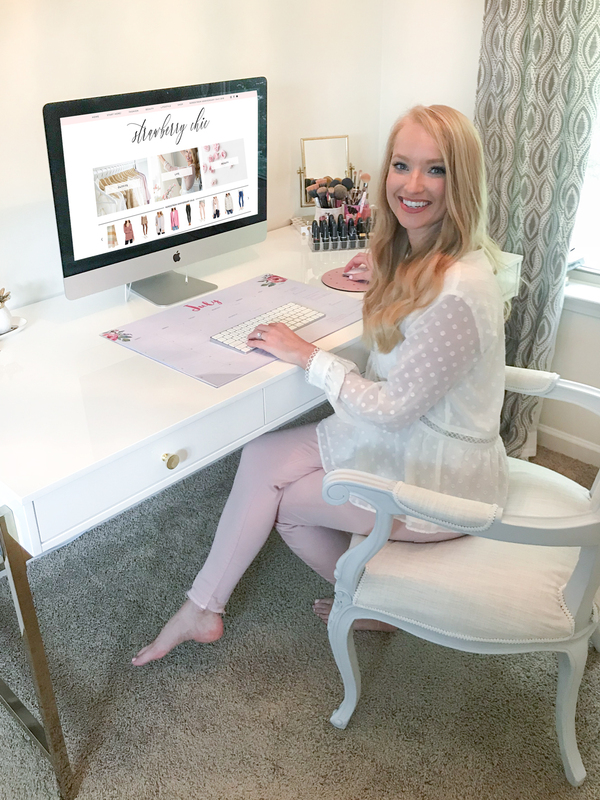 When I started blogging I signed up with Shopstyle because I didn’t have enough content to get accepted into Reward Style. I initially made 10 cents per click. Pretty quickly, that commission went down to 1-2 cents per click! Depending on the bloggers’ audience, they may find more success using one or the other platforms for affiliate income. Not all links are, at least on my site. Some products I use aren’t on the Reward Style platform, but I still share them here if I like them. You can tell if you clicked an affiliate link if you look at the URL bar when you click a link. If it goes directly to a retailer, it wasn’t an affiliate link. If you see the link go through a link before going to the website is an affiliate link (it will look something like this in the URL – RSTYLE.ME or BIT.LY). If you click images in widgets like the one below, the links are affiliate links. I hope you found this post informative and it answered your questions about blogging income and affiliate commission. If you still have any questions, reach out and I will be happy to answer! 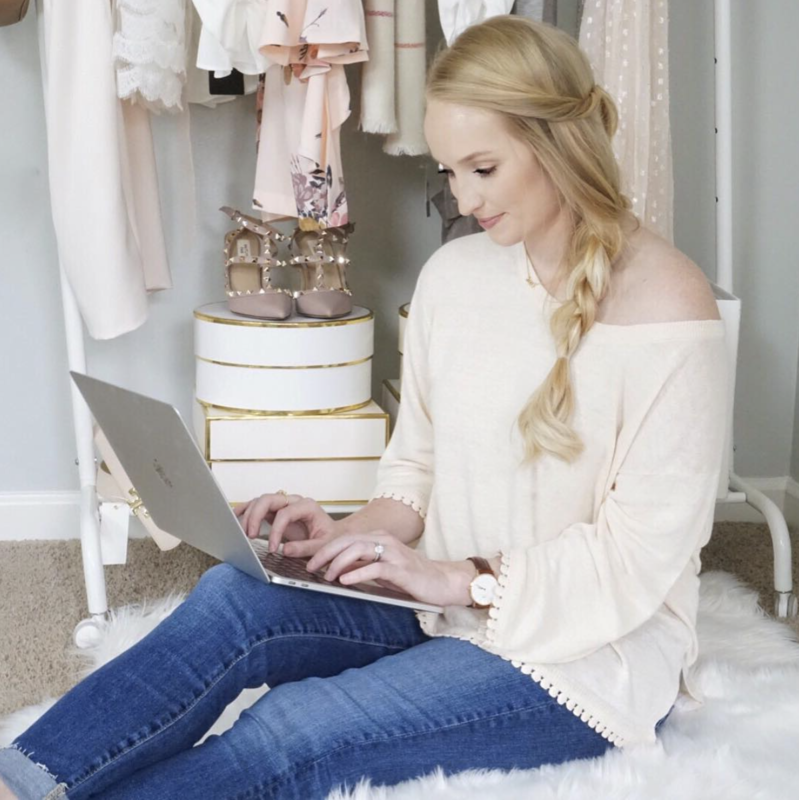 If you have more questions about blogging, you may be interested in my Blogging Q&A where I answered my most common blogging questions from Instagram DM’s.